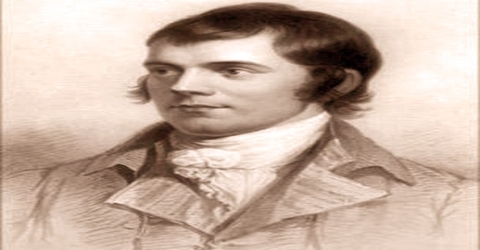 Robert Burns – Scottish poet and lyricist. Robert Burns (a famous Scottish poet and lyricist) was born in Alloway, Ayrshire, Scotland, on January 25, 1759, to hard-working farmer parents. He was also famous for his amours and his rebellion against orthodox religion and morality. He began helping his father with farm work at the age of twelve. The difficulty of the labor later had a crippling effect on his health. Although Burns’s formal schooling was limited, he loved to read and for a time he was tutored by John Murdoch, who thoroughly educated him in eighteenth-century English literature. 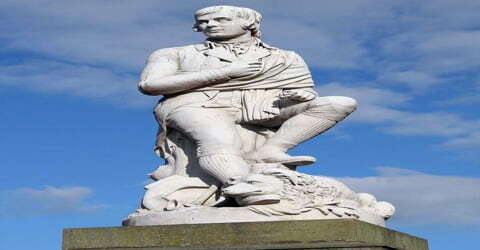 Also known as Rabbie Burns, or Scotland’s favorite son, Burns is often credited as the national poet of Scotland and is the best known Scottish language poet till date. Burns is also considered as the pioneer of the Romantic Movement. He is also known to inspire the founders of both liberalism and socialism. During the 19th and 20th centuries, the celebration of his life and works became a national charismatic cult, his influence being clearly visible in Scottish literature. He is regarded as a pioneer of the Romantic movement, and after his death, he became a great source of inspiration to the founders of both liberalism and socialism, and a cultural icon in Scotland and among the Scottish diaspora around the world. In 2009 he was chosen as the greatest Scot by the Scottish public in a vote run by Scottish television channel STV. As well as making original compositions, Burns also collected folk songs from across Scotland, often revising or adapting them. His poem (and song) “Auld Lang Syne” is often sung at Hogmanay (the last day of the year), and “Scots Wha Hae” served for a long time as an unofficial national anthem of the country. 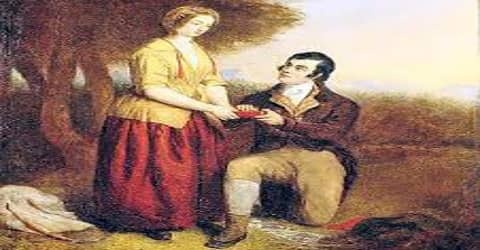 Other poems and songs of Burns that remain well known across the world today include “A Red, Red Rose”, “A Man’s a Man for A’ That”, “To a Louse”, “To a Mouse”, “The Battle of Sherramuir”, “Tam o’ Shanter” and “Ae Fond Kiss”. 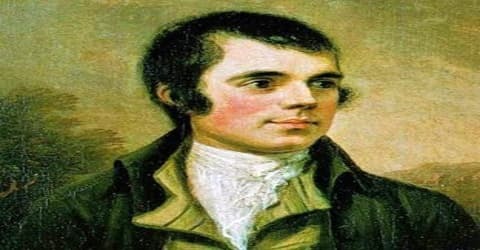 Robert Burns, also known as Rabbie Burns, the Bard of Ayrshire, Ploughman Poet and various other names and epithets, was born on 25th January 1759 in Alloway, Ayrshire, Scotland. His father, William Burnes was a self-educated tenant farmer who married a local girl, Agnes Broun. Robert Burns was the eldest of seven children to the couple. When Robert was seven years old, his father sold their house and took tenancy of the 70-acre Mount Oliphant farm, southeast of Alloway. Robert’s childhood days went to poverty and hardship, which led to his weak constitution. Burns’s father had come to Ayrshire from Kincardineshire in an endeavor to improve his fortunes, but, though he worked immensely hard first on the farm of Mount Oliphant, which he leased in 1766, and then on that of Lochlea, which he took in 1777, ill luck dogged him, and he died in 1784, worn out and bankrupt. It was watching his father being thus beaten down that helped to make Robert both a rebel against the social order of his day and a bitter satirist of all forms of religious and political thought that condoned or perpetuated inhumanity. He had little regular schooling and got much of his education from his father, who taught his children reading, writing, arithmetic, geography, and history and also wrote for them A Manual Of Christian Belief. He was also taught by John Murdoch (1747–1824), who opened an “adventure school” in Alloway in 1763 and taught Latin, French, and mathematics to both Robert and his brother Gilbert (1760–1827) from 1765 to 1768 until Murdoch left the parish. After a few years of home education, Burns was sent to Dalrymple Parish School in mid-1772 before returning at harvest time to full-time farm labor until 1773, when he was sent to lodge with Murdoch for three weeks to study grammar, French, and Latin. At the young age of 15, Robert was the main laborer at Mount Oliphant. In the summer of 1775, he was sent to Kirkoswald to finish his education. In 1777, his father shifted his family from Mount Oliphant farm to the 130-acre farm at Lochlea, near Tarbolton. In 1779, he joined a country dancing school and the following year, formed the Tarbolton Bachelors’ Club with his brother Gilbert. In 1781, Burns went to Irvine, North Ayrshire to learn to become a flax-dresser. But shortly after the flax shop caught fire in New Year celebrations, Robert had to return to Lochlea. Robert Burns had an affair with a servant girl at the farm, Elizabeth Paton, who in 1785 bore his first child, and on the child’s birth, he welcomed it with a lively poem. While he was embarking on a relationship with Jean Armour, who became pregnant with twins in March 1786. Burns signed a paper attesting his marriage to Jean, but her father “was in the greatest distress, and fainted away”. To avoid disgrace, her parents sent her to live with her uncle in Paisley. Although Armour’s father initially forbade it, they were eventually married in 1788. Armour bore him nine children, only three of whom survived infancy. Meanwhile, he also fell in love with Mary Campbell, whom he had met in the church while living Tarbolton. She later sailed home to her parents in Campbeltown. In October 1786, Mary and her father sailed from Campbeltown to visit her brother in Greenock. Her brother fell ill with typhus, which she also caught while nursing him. She died of typhus on 20 or 21 October 1786 and was buried there. Robert Burns developed rapidly throughout 1784 and 1785 as an “occasional” poet who more and more turned to verse to express his emotions of love, friendship, or amusement or his ironical contemplation of the social scene. But these were not spontaneous effusions by an almost illiterate peasant. Burns was a conscious craftsman; his entries in the commonplace book that he had begun in 1783 reveal that from the beginning he was interested in the technical problems of versification. At the age of 22, Robert was initiated into Masonic Lodge St David Tarbolton. When this lodge became inactive, he joined the Lodge St James Tarbolton Kilwinning number 135. 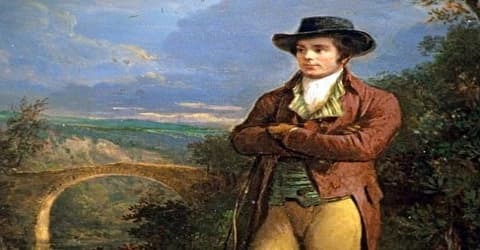 During the time period 1784-85, Robert Burns was heavily involved in lodge business, attending meetings, passing and raising brethren and usually running the lodge. Burns was in financial crisis and took an offer from a friend to work in Jamaica, at a salary of £30 per annum. In 1786 he published Poems, Chiefly in the Scottish Dialect at nearby Kilmarnock, Scotland, and the book was a success. At this time Burns was twenty-seven, and he had written some of the most effective and biting pieces of satire (ridicule or scorn) in the language. Among them were “Holy Willie’s Prayer” (a dramatic speech that mocked a believer in Calvinism) and “The Holy Fair” (a humorous description of a Scottish religious camp meeting). On 31 July 1786, John Wilson published the volume of works by Robert Burns, Poems, Chiefly in the Scottish dialect. Known as the Kilmarnock volume, it sold for 3 shillings and contained much of his best writing, including “The Twa Dogs”, “Address to the Deil”, “Halloween”, “The Cotter’s Saturday Night”, “To a Mouse”, “Epitaph for James Smith”, and “To a Mountain Daisy”, many of which had been written at Mossgiel farm. The success of the work was immediate, and soon he was known across the country. In November 1786, Burns set out for Edinburgh where he sold the rights of his book to William Creech. Burns was famous in the city and was guest at many aristocratic gatherings. The new edition of his poems brought Burns £400. 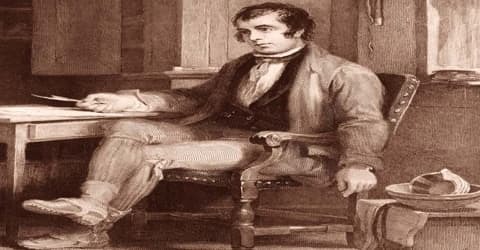 Burns selected his Kilmarnock poems with care: he was anxious to impress a genteel Edinburgh audience. In his preface, he played up to contemporary sentimental views about the “natural man” and the “noble peasant,” exaggerated his lack of education, pretended to a lack of natural resources, and in general acted a part. The trouble was that he was only half acting. He was uncertain enough about the genteel tradition to accept much of it at its face value, and though, to his ultimate glory, he kept returning to what his own instincts told him was the true path for him to follow, far too many of his poems are marred by a naïve and sentimental moralizing. During his stay in the city, Burns made many close friends. These friends included the influential Lord Glencairn and Frances Anna Dunlop. For a brief time period, Burns was involved with Agnes ‘Nancy’ McLehose, with whom he exchanged passionate letters. In Edinburgh, he also befriended James Johnson who was a struggling music engraver. Burns returned to Ayrshire on February 18, 1788, and hired the farm of Ellisland near Dumfries. Other important poems that appeared in his first volume were “Address to the Unco Guid” (an appeal to the religious not to look down on sinners); “The Jolly Beggars” (a dramatic poem celebrating poor people); the masterful “Address to the Deil” (that is, to the Devil); “The Cotter’s Saturday Night” (in praise of the Scottish countryside); and the moving “Auld Farmer’s Salutation to His Mare” and “To a Mouse” (the latter a poem written to a field mouse who has been killed by a farmer while plowing). These and other poems by Burns are almost unequaled in their combination of accurate local language and depth of feeling. Not for centuries had such fine poetry been written in the Scots tongue. On 27 November 1786 Burns borrowed a pony and set out for Edinburgh. On 14 December William Creech issued subscription bills for the first Edinburgh edition of Poems, Chiefly in the Scottish dialect, which was published on 17 April 1787. Within a week of this event, Burns had sold his copyright to Creech for 100 guineas. For the edition, Creech commissioned Alexander Nasmyth to paint the oval bust-length portrait now in the Scottish National Portrait Gallery, which was engraved to provide a frontispiece for the book. In 1788 Burns leased a farm at Ellisland, Scotland, forty-five miles from Mauchline. After annoying delays in the building of his house and several rough years trying to make an income from his farmland, he moved with Jean and the children to Dumfries, Scotland. In 1789 he had begun working as a tax inspector, a profession in which he continued until his death. At Ellisland Burns had little free time, but it was there that he wrote his masterpiece of comic humor “Tam o’Shanter,” his one outstanding piece of narrative verse. In 1789, he has appointed duties in Customs and Excise. After working as an exciseman, Burns found it hard to go back to farming and as such, gave it up in 1791. Meanwhile, in November 1790, he had written “Tam O’ Shanter”. About this time he was offered and declined an appointment in London on the staff of The Star newspaper, and refused to become a candidate for a newly created Chair of Agriculture in the University of Edinburgh, although influential friends offered to support his claims. He did, however, accept membership of the Royal Company of Archers in 1792. As a lyricist, Burns made important contributions to Scottish music. When he was requested to write lyrics for The Melodies of Scotland, he made his contribution of over 100 songs. His also made remarkable contributions to George Thomson’s “A Select Collection of Original Scottish Airs for the Voice” and James Johnson’s “The Scots Musical Museum”. He also collected and preserved old Scottish folk songs, some of which he revised, adapted and expanded. One of these known collections was “The Merry Muses of Caledonia”. Some of his famous adapted folk songs are “Auld Lang Syne”, “A Red, Red Rose” and “The Battle of Sherramuir”. From 1792 until his death he also contributed to a similar work, A Select Collection of Original Scottish Airs. Most of Burns’s poetic efforts in the Ellisland and Dumfries periods was in this area of songwriting and song editing (he had written songs earlier but had usually not published them), and the results were very popular. Among the lyrics that he composed or reworked were “Mary Morison,” “Highland Mary,” “Duncan Gray,” “Green Grow the Rashes, O,” “Auld Lang Syne,” “John Anderson, My Jo,” “Scots Wha Hae Wi’ Wallace Bled,” “A Man’s a Man for A’ That,” “A Red, Red Rose,” and “Ye Banks and Braes o’ Bonie Doon.” These are true song lyrics that is, they are not poems meant to be set to music but rather are poems written to melodies that define the rhythm. Burns’s worldly prospects were perhaps better than they had ever been, but he had become soured and had alienated many of his friends by freely expressing sympathy with the French and American Revolutions and the advocates of reform and votes for all men. His political views came to the notice of his employers and in an attempt to prove his loyalty to the Crown, Burns joined the Royal Dumfries Volunteers in March 1795. As his health began to give way, he began to age prematurely and fell into fits of despondency. The habits of intemperance (alleged mainly by temperance activist James Currie) are said to have aggravated his long-standing possible rheumatic heart condition. Robert Burns’s poetry had the elements of classical, biblical, and English literature, as well as the Scottish Makar tradition. He was skilled in writing in both Scots language and Scottish English dialect. The themes of his poetry generally included republicanism, radicalism, Scottish patriotism, anticlericalism, class inequalities, gender roles, poverty, and sexuality. Burns is often considered as a proto-Romantic poet, who influenced William Wordsworth, Samuel Taylor Coleridge, and Percy Bysshe Shelley. Additionally, there are many organizations honoring him, which include the Robert Burns Fellowship of the University of Otago in New Zealand, and the Burns Club Atlanta in the United States. There are also many towns named after him such as Burns, New York, and Burns, Oregon. Also, there is a statue of Robert Burns in the Octagon in Dunedin, New Zealand. Burns’s birthplace in Alloway is now a public museum known as Burns Cottage. His house in Dumfries is operated as the Robert Burns House, and the Robert Burns Centre in Dumfries features more exhibits about his life and works. Ellisland Farm in Auldgirth, which he owned from 1788 to 1791, is maintained as a working farm with a museum and interpretation center by the Friends of Ellisland Farm. Culturally, Scotland celebrates Burns Night, effectively a second national day, 25th January every year with Burns suppers around the world. It is more widely observed than the official national day, St. Andrew’s Day. 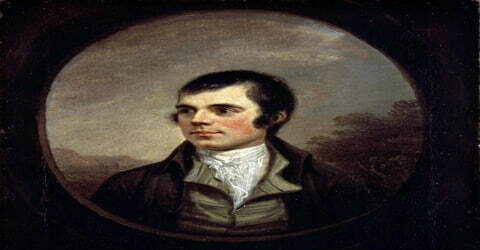 Robert Burns died on July 21, 1796, in Dumfries at the age of 37. His wife gave birth to their last child on the day of his funeral. He was at first buried in the far corner of St. Michael’s Churchyard in Dumfries; a simple “slab of freestone” was erected as his gravestone by Jean Armour, which some felt insulting to his memory. 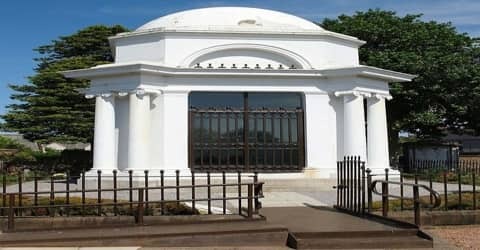 His body was eventually moved to its final location in the same cemetery, the Burns Mausoleum, in September 1817. The body of his widow Jean Armour was buried with his in 1834. Robert Burns was posthumously given the freedom of the town of Dumfries. Hogg records that Burns was given the freedom of the Burgh of Dumfries on 4 June 1787, 9 years before his death, and was also made an Honorary Burgess of Dumfries. Through his twelve children, Burns has over 600 living descendants as of 2012. In Russia, Burns became popular as “people’s poet”. He was also regarded as the symbol of ordinary Russian people. In 1956, the Soviet Union brought out commemorative stamps in his honor. Burns is pictured on the £5 banknote (since 1971) of the Clydesdale Bank, which is one of the Scottish banks with the right to issue banknotes. In 2009, the Royal Mint issued a commemorative two-pound coin featuring a quote from “Auld Lang Syne”. Many Burns club has been founded worldwide. His themes included republicanism (he lived during the French Revolutionary period) and Radicalism, which he expressed covertly in “Scots Wha Hae”, Scottish patriotism, anticlericalism, class inequalities, gender roles, commentary on the Scottish Kirk of his time, Scottish cultural identity, poverty, sexuality, and the beneficial aspects of popular socialising (carousing, Scotch whisky, folk songs, and so forth).